After 128 years, the Kaufmann clock still tolls, but in the coming months visitors meeting under it won’t be in front of a department store. Macy’s, a Cincinnati-based department store chain, announced Monday the closing of the 13-floor Downtown Pittsburgh store at 400 Fifth Avenue. The building was sold earlier this year to Philadelphia-based Core Realty, which touts mixed-use redevelopment for the space. Mayor Bill Peduto said in a release his office is working with Macy’s and the new developer, Core, to preserve store icons such as the Kaufmann clock and the Tic Toc Restaurant. May Department Stores Company acquired the building in 1946; Macy’s Inc. bought in 2005. According to a Macy’s press release, the corporation has been investigating the best possible use for the property since 2011. Waldrup said the location will provide Downtown with residential growth. “We’re continuing to see the growth of the residential market in Downtown, and that’s really increased the vibrancy of the center city and this project will continue to accelerate that growth and development both from a residential perspective and also a hotel perspective,” he said. About 30 Macy’s branch associates who work on the 11th floor will be relocated to another store in the Pittsburgh area, according to the press release, while the store's other 170 employees will be offered positions at nearby stores where possible. Employees, who were notified of the closure Monday morning, will also be offered severance benefits. Waldrup said the Downtown Partnership provided insight to the developer offering data backing up the need for residential units. “So we provided a lot of market information not just to Core but to really any developer looking at Downtown," he said. Macy’s will start a final clearance sale at the Downtown store Monday. The sale is expected to run through September. 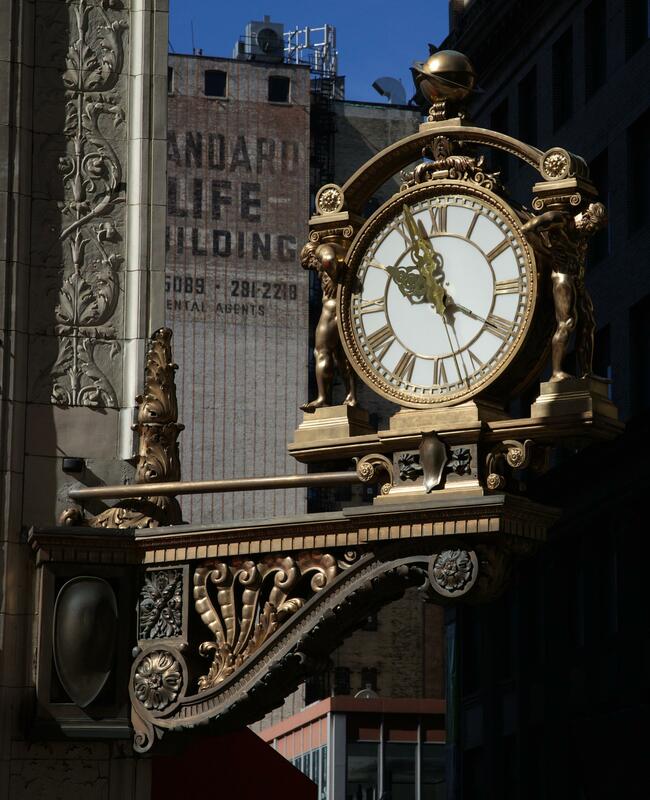 After a century in downtown Pittsburgh, residents of the city can still recall telling friends and family to “meet me under the Kaufmann’s Clock.” The bronze ornamental clock, which still hangs at the corner of Smithfield Street and Fifth Avenue, has served as a meeting place for Pittsburghers for years. Macy's celebrates the clock's 100th anniversary with a city proclamation of May 17th as "Meet Me Under the Clock Day" as well as events surrounding this cherished Kaufmann's tradition. "Meet me under Kaufmann's Clock" has been said for decades — 10 to be exact — by friends, families and lovers as a rendezvous in downtown Pittsburgh. This week marks the 100th anniversary of the installation of the clock on the department store at Fifth and Smithfield. While Kaufmann's is gone, Macy's made sure it kept the Pittsburgh icon when it acquired the department store chain. On Friday dozens of people with special memories of "meeting under the clock" gathered to mark the centennial.